Home Driving in KSA License, Istamara and Fahas How to apply for the Saudi Driving License for Women? When it comes to driving license, it is clear that the new women drivers can easily obtain a new driving license after completing the relevant procedure, but there are several women residing the Kingdom who have obtained their driving license from other countries. They can easily convert their foreign driving license with a Saudi Driving License. Training Schools: Women who do not have a driving license issued from any other country will have to get admission to a training school in Saudi Arabia and complete a certain number of hours training before appearing for an actual test for a driving license. Currently, five universities have driving schools for women, namely Princess Nourah bint Abdulrahman University, Imam Muhammad ibn Saud Islamic University, King Abdul Aziz University, Tabuk University, and Taif University. Emirates Driving Institute and Princess Nourah University worked up a partnership to open the driving school at the University. Emirates is a renowned driving school in Dubai. Ford Motor Company has launched the driving skills for life program in collaboration with Effat University. The Program focuses on imparting women with automotive knowledge and encouraging them behind the behind the wheel so that they drive confidently. Currently, women who are in the dependent category cannot get an appointment themselves. Their sponsors (husband) can get an appointment for them as explained in Step 5 below. Step 3 – Medical Test for Saudi Driving License: Go to any of the approved clinics of Saudi Government to undergo Blood Test and Eye Test. These approved clinics will charge you around SR 150 and upload your medical report to Efada website. Step 4 – Translation of Foreign Driving License: The Driving License issued from a foreign country must be translated into Arabic, scanned and uploaded in their system in PDF format. Search for certified translating service in your city. Normally they charge in the range of SR 40 to SR 100. 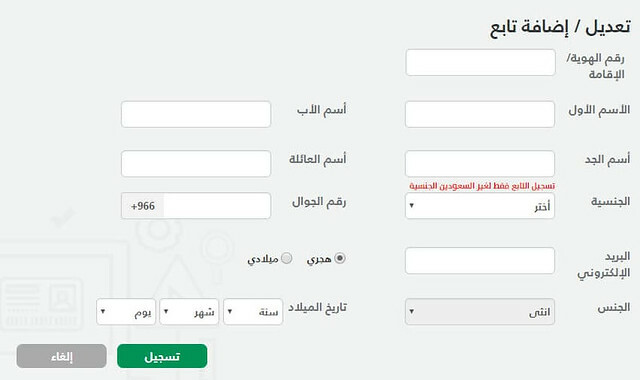 Step 5 – Appointment from Saudi Driving License Portal: Follow these steps to get an easy appointment with (SDLP) Saudi Driving License Portal to replace your driving license. You need to log in with your Absher ID and Password. In case you don't have an Abshir account as you are a dependent, your sponsor can log in and fill the form for you. 2-Fill the form and register the application. You will be required to upload the following documentation in the portal. Once the documents are uploaded, you will be able to get an appointment for the driving test as well as enrolling fingerprints. It is very difficult to get an appointment these days. So you can try to book at different locations in your range. If the booking is successful, you will receive an SMS from Maroor about your driving license appointment time, date and map. Step 6 – Visit the Traffic Police Office for the Driving Test: Visit the Maroor or Saudi Traffic Police Office on the date and time of appointment with the following documents. The staff at the traffic police officers will check all the documents and register you in the system and issue you one token to go for the driving test. Step 7 – Driving Test: If your driving license belongs to one of those countries which are acknowledged by Saudi Traffic Police e.g. UK, USA, UAE, Bahrain, Oman or Kuwait, you will not have to go through a driving test. You will be required to appear in a driving test if your driving license does not belong to the above-mentioned countries. In a Normal Driving Test, Instructor will test your skills through a zigzag test, Reverse test, and he may ask you to drive at full speed and apply break at some point. You should avoid these common mistakes during the driving test. Printing the Driving License: If you pass the driving test, the last step is to print the Saudi Driving License. Do we have to surrender our Foreign Driving License? Women from any nationality can convert their driving license with the Saudi Driving License. They don’t have to surrender their current driving license issued by a foreign country. The procedure is similar to what men have to face for the Conversion of UAE Driving License. 2- What kind of vehicles are women permitted to drive? All types of vehicles including motorbikes except trucks. 4-Were women ever permitted to drive in Saudi Arabia? It is believed that women used to drive in rural areas at one time.